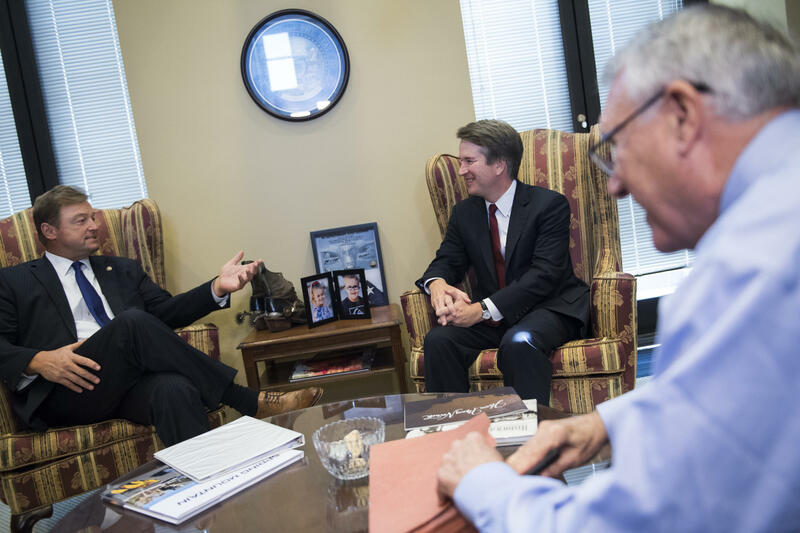 Supreme Court nominee Brett Kavanaugh, center, Sen. Dean Heller, R-Nev., left, and former Sen. Jon Kyl, R-Ariz., meet in July 2018. Kyl is serving as Kavanaugh's "Sherpa" as he introduces him to members of Congress. In recent weeks, the Ombudsman's Office received complaints from listeners and readers about a handful of specific words used by the newsroom. These listeners and readers argued that the words have racial histories that made them inappropriate. This is an ongoing concern of NPR audience members: words that are in common usage, but that a growing number of people now understand have racial or ethnic roots that make them offensive to some, at least in some situations. What is NPR's obligation here, when language that may seem innocuous to some, or is being used by people in the news, also turns out to be language that others might find harmful? We should acknowledge that there is a difference between language that might be questionable and words that are widely perceived as patently offensive. Occasionally, the latter slip into NPR's reporting. A few weeks back an editor used the word "scalp" in describing a political victory; that is an example of a word that NPR's Standards and Practices Editor Mark Memmott said should have been avoided because it carries the connotation of historic violence toward indigenous people. But the issue here is that other words fall into a more ambiguous category. One story about the practice of a former senator accompanying a Supreme Court nominee around the Capitol to meet members of Congress included the word "Sherpa" both in the headline and throughout the piece. It's a widely used political term (NPR didn't decide to call it that), but it comes from the name for members of a Nepalese ethnic group and has been appropriated over the years to mean "guide" or an aide who does preparatory work for a boss. Should the piece have included information about its origin? Or, as a listener wrote, should NPR have avoided the word altogether? Another story originally included the word "spook" (used as a verb) in the headline ("Netflix Falls Short On Subscriber Target, Spooks Investors") and body of the piece about stock market investors. Leah Donnella of the race and identity reporting team Code Switch wrote last year that "spook" has history as an anti-black slur, at least when used in the context of race. Could a different word have been used in the headline to convey "frightened" or "scared?" In my opinion, there is nothing wrong with NPR's decision to report on nominee Brett Kavanaugh's experience with a "Sherpa." The headline rightly puts the term in quotes to establish that it is not NPR's label. But for radio listeners, there was no context provided when the guest said that Sherpa is "kind of a funny name" for a person "bringing someone up a mountain." The host added, "And carrying all the bags." Courtney Dorning, an editor for All Things Considered who worked on the piece, acknowledged that words can have multiple meanings. "I think language and meaning is very complex, and as much as we try to be mindful and sensitive, unfortunately there are going to be misses," Dorning said. One way to handle this going forward would be to add a quick line acknowledging that the word should be treated carefully. So, this Halloween, be a little cautious when it comes to describing your surroundings. And don't be afraid of creeping into the thesaurus for a spooky synonym." Her piece leaves me with this conclusion: It would be inappropriate to use the word "spook" to refer to a situation involving black people. But it's still fairly innocuous to use the word as the piece in question did, in a context entirely unrelated to race. It's a frequently used word, well-removed from its historical ties to racism — for most people, most of the time. But for those who know about its history: "If I were reading the word 'spook' in a headline, the way [NPR] used it, obviously part of my brain would tingle, my Spidey sense would tingle, just because I know that this other usage is out there, but also the context here is clearly not racialized," Code Switch podcast co-host and lead blogger Gene Demby said. "Race is one of those things that when it irradiates a word, it's there whether you mean it to be or not." One might think the decision would be simple if the person who wrote the headline knew about this context; they could have replaced "spook" with one of its many synonyms. In this case, the editor who approved of the language says she did know about the word's history. "As an African-American woman I am very much aware of 'spook' in its negative context," Stacey Samuel, who is a supervising editor at NPR and has been working as a news desk editor, said. But, "In the moment when I was editing this piece, I was not looking at the piece or the use of the word from the perspective of a person who's African-American, but as a journalist, and understanding and appreciating the nuance of the word and understanding the language and context in which it was used. It never crossed my mind." Nevertheless, Samuel said she regrets that the use of "spook" was taken offensively, and she updated the piece with a different word. "At this particular time, it is more imperative than ever to revisit language, because not knowing is not an excuse." Memmott said these examples are in somewhat ethically gray areas. "We don't just blindly repeat things that we know would be highly offensive," he told me. But at the same time, he added: "You may not always know when a word's usage has shifted or you may not realize it yet. So you may be guilty of being slow picking up on changes and usages and sensitivities. But we're always open to being told when we were wrong and more sensitized to how we should be more careful with something." Language is ever-evolving, and NPR updates its standards to reflect that, Memmott said. He cited the language that NPR uses to describe immigrants who enter the U.S. illegally; both AP style and NPR's in-house style direct reporters to describe actions as illegal and not people, whereas before it was considered acceptable to use terms like "illegal immigrant" or "alien." Of course, journalists and editors cannot possibly be expected to know the whole history of every word they use. Shereen Marisol Meraji, co-host of the Code Switch podcast, discussed in a recent episode an instance when she wrote in a script that Memmott was NPR's "ethics guru." In a listening session later, her colleagues pointed out that using the word "guru" might be appropriative of its Indian roots. Meraji hadn't considered that context before, and decided to cut it out of the script. But the circumstances that led to that change were unique, Demby said, because this happened in a session with about eight people from the Code Switch team. Aside from the fact that the Code Switch staff is already more likely than other newsroom teams to be thinking about how its language impacts its audience, there is usually just not the time for this kind of review in breaking news situations or for daily shows. Not everything a listener complains about merits correction (our office gets daily complaints from offended listeners where the reporting decisions were defensible). But when members of a historically marginalized group make the case for why the language NPR used is harmful to them, the newsroom should treat it as an opportunity for growth. "As this country becomes browner, it is going to become clearer how much the dynamics of oppression have played out in our language," Demby said. "Because there are all these things that have seemed innocuous for so long that have been the language that people could use in print and on the radio that we are going to find out, for lots of communities, has very loaded connotation," he added. The newsroom should be mindful when using words like "Sherpa" or "spook," especially when the audience speaks up about it. Every instance like this does not require that the newsroom go back and change its language as Samuel did, but the newsroom should avoid this language in the future without providing more context. "One of our core principles is respect. And that includes respecting people for how things will hit their ears or hit their hearts, and adjusting appropriately," Memmott said. Jeanine Santucci is an intern in the Office of the Ombudsman. You can find her on Twitter at @JeanineSantucci.